[By Mario Luz in Portugal]. Currently living in New Zealand, we go every two years to our hometown on the south of Portugal to see the family and to be tourists in our own country. This time we did a stop over in Amsterdam to see some friends then we flew straight to Faro airport. I do not recommend traveling with a bag full of gouache tubes with you, the airport security always look suspicious at me after the x ray and asks - is this your backpack? then I have to explain that it´s water based and its for sketching, I usually show the sketchbook and then they get convinced that those tubes are not used to make bombs. We booked our holidays to match the Porto symposium dates so that way we could go up north, revisit old friends and see how our previous home city changed since we study architecture there, back in 2001. Was also back then that my interest in sketching started growing. Porto center these days has changed a lot, it is alive, I never saw so many tourists in streets as now. 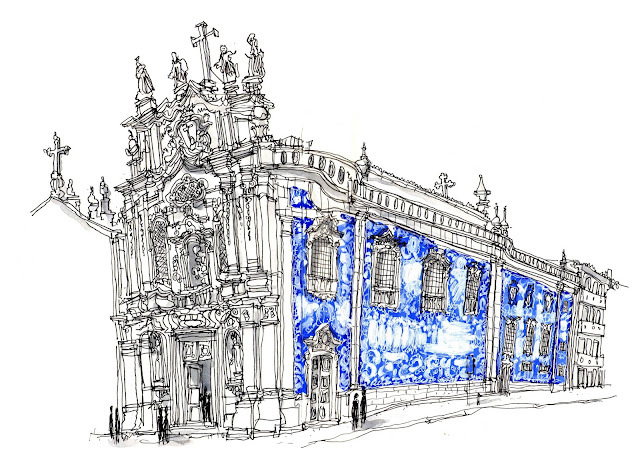 Looks like the world found out the beauty of Portugal and this symposium happened to prove it. My first symposium experience was very rewarding, walking around with so many sketchers its like being in family with strangers, everyone suffer from the same "disease", the obsession of capturing the reality on a piece of paper, the wish to see more and to go beyond the first layer of reality. There was beauty waiting to be sketched on every corner of this city. Other good thing of the symposium was that it help me to put a face and a personality on the drawings that we I usually follow on the blog and the whole thing made sense. On the blog the drawings talk for you and on the symposium you talk of them. The urban sketchers team made a great effort and the result was an amazing symposium, I thank you all.